In what feels like the blink of an eye we’re approaching the halfway point of the NFL season. That also means the fantasy football season will be into the final weeks and playoffs before you know it. In short, we’re entering a critical junction of the fantasy season. That makes right now a better time than ever to tune in to Prime Time Fantasy Football! 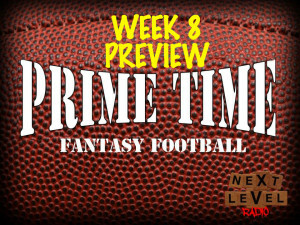 On the week 8 preview show of Prime Time our listener questions will cover a quarterback ready to come back this week and a young wideout trending in the right direction. Then our 14-game preview includes bye week fill-in options for all the positions you need to cover, plus we’ll talk about what you should do with Gary Barnidge, and have a spirited debate about which Texans running back is the right replacement for Arian Foster. Finally, you know the end of the show by now. We’ll close with our Show Me The Money segment and Facts of the Week.